Those that enjoy traditionally structured classical music may find this album a little heavy going. Schoenberg's work is at best atonal, and some may describe it as chaos. Those that study and appreciate the composer's form would probably describe it as delivering beauty out of chaos. 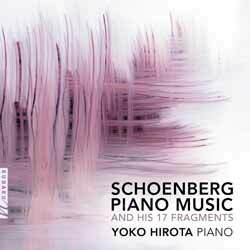 While it's not the sort of music I normally tend to listen to for pleasure, as a complex and engaging collection of pieces that challenge the normal conventions of classical music you can't argue that Schoenberg certainly delivers an engaging and thought provoking collection here.